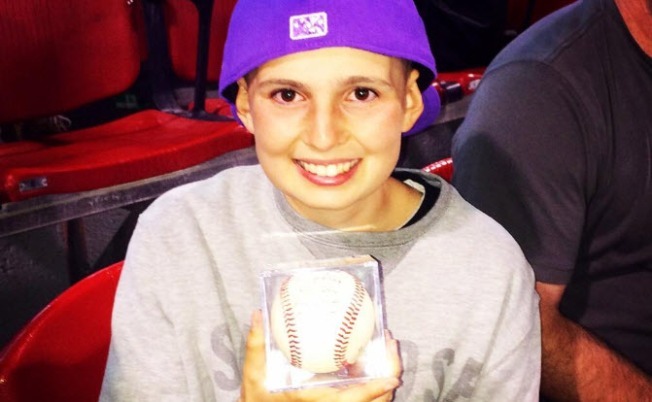 Twelve-year-old Lyndsey Dworkin holds her Brandon Belt autographed home run ball. San Francisco Giants slugger Brandon Belt is expected to return from the disabled list sometime this week, and when he does, he will have a new number one fan cheering him on. Twelve-year-old Lyndsey Dworkin tossed out the first pitch at the San Jose Giants game on Friday, sporting her Brandon Belt shirt. Belt was rehabbing in San Jose to prepare for his return to San Francisco. Dworkin is a brain cancer survivor, and after the first pitch, Belt told her he would hit a home run for her--and he did. Belt eventually got the ball back and gave it to Lyndsey and wrote on it: "To Lyndsey--my good luck charm." Belt has invited the family to watch batting practice on the field at AT&T Park as soon as he gets back to the team. Belt broke his thumb at Dodger Stadium in May after he was hit there by Los Angeles Dodgers left-hander Paul Maholm.